If you’re looking for a simple, delicious crispy snack that works for gluten-free, grain-free, vegan and paleo diets—look no further! 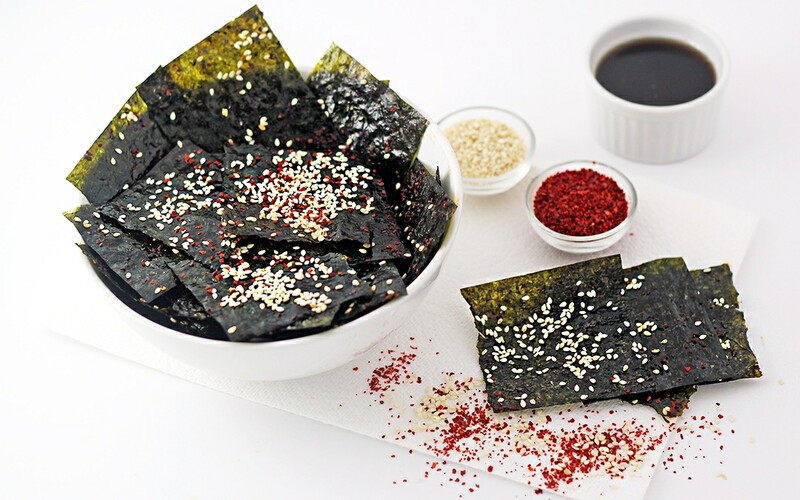 These spicy sesame nori crackers use four simple ingredients and couldn’t be easier to make. Plus, nori is a source of iodine, magnesium, calcium and iron, and many studies have shown its effectiveness in preventing inflammation. This recipe gets a bit of heat from the gochugaru (Korean red chili pepper), but feel free to substitute a pinch of pepper of your choice or leave it out entirely. 1. Cut each nori sheet into 9 squares. Brush one side of each square with sesame oil. Lay squares, with the oiled side up, on a sheet pan and sprinkle the sesame seeds and gochugaru (if using). 2. Roast for 15–20 minutes, or until crispy. Remove from the oven, let cool, and enjoy. Tip: Make sure there’s room on the sheet pan around the nori squares when roasting, as this will give you the crispiest results. If needed, roast the squares in two batches.